-glue stick I used an Elmer's one because that's what I had! Cut your paper into thin strips. You will need 12 total strips, per snowflake. Then fold 2 in half. Place these two, one on top of the other, at the folds making a cross. Glue the strips together, then flip it over. Now you will attach 2 more strips with glue, this begins the "weaving" look of the center. Notice how the middle strip is on the "bottom" and the 2 sides are on "top". Now turn the "cross" so the 3 strips are going side to side. "Weave" one strip to the right of the center, over, under and over again. Put a dab of glue on the tops of the outside strips. Repeat this on the left side of the center strip. Your first 6 strips of paper should now be glued together like this. Notice the square basket pattern in the center. Now you will begin to create "loops" around the corners. Notice the "back" of the left strip is being glued to the "front" of the strip on the right side. Glue together, hold a few seconds until glue dries. Repeat this step at each 4 corners. The "center" strip will not be used in this step. Now repeat ALL above steps with your next 6 strips of paper. You will end up with two just like the above photo. Now we are going to attach the two together. Lay one side with loops face up and then take the other and place it on top with loops facing down. Also, notice the alignment, the loops on the top piece are on top of the flat strips of the bottom piece. This is important. You will be attaching a loop from the top piece, to a flat strip from the bottom piece with glue. Place a dab of glue on the end of the flat strip and tuck it inside the loop. The glue will go where the two pieces meet. and you will repeat this all the way around. Glue each flat strip to the loop above it until they are all connected. Like this! Once you have all the snowflakes you like, I simply "threaded" them onto a length of twine, tying knots so they didn't slide around. As you can see, I made 5 large snowflakes and 4 smaller ones. 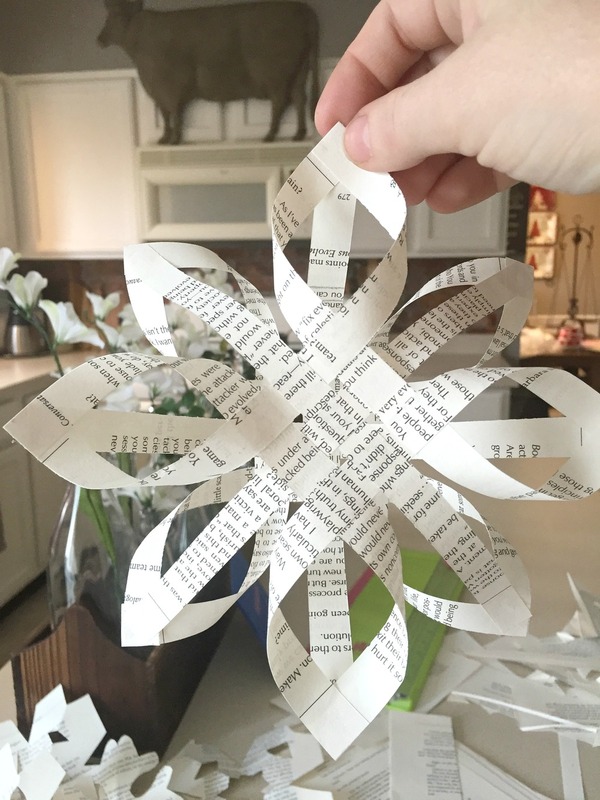 I hope you enjoyed this little tutorial and you make snowflakes until your hearts content!